NIU’s Gender & Sexuality Resource Center (GSRC) has planned several events in celebration of 2016 LGBTQIA Awareness Month. Unless noted, all events are free and open to the public. The GSRC is located at 105 Normal Road, in the Arndt house. For more information, or to request accommodations, call (815) 753-GSRC (4772). The GSRC begins LGBTQIA Awareness Month with celebrating Transgender Day of Visibility! All are encouraged to visit the GSRC to obtain a button that states, “Ask my pronoun.” This button campaign aims to encourage conversation and education about why pronouns are so important to individual identity and overall well-being. The GSRC staff will also be handing out buttons at various events throughout the month. Please join Romeo Jackson for their last program at NIU as an undergraduate student as they lead a guided and highly interactive discussion about how we use and “make sense” of personal and political terms to understand ourselves and the world. Drawing heavily on the frameworks from (queer) women of color feminisms, Romeo will lead an intersectionally dynamic and multi-media conversation about (re)defining ideas of blackness, queerness, womanhood and feminism. Join us for our 12th year and celebrate students, faculty and staff who have made positive contributions to the LGBTQ community at NIU and beyond in 2015-16. Co-sponsored by Prism; the Center for the Study of Women, Gender & Sexuality; and the Presidential Commission on Sexual Orientation and Gender Identity (PCSOGI). Join us at the Gender & Sexuality Resource Center for an open mic night with poetry, music and much more. We want to see the amazing talent NIU students have! Come on by for a night of fun and entertainment! Wednesday, April 13, 5:30 p.m.
Come join us for a queer-centered sexual health program in which you’ll be invited to craft barriers for diverse bodies, as well as your very own barrier carrier. This event is an opportunity to engage in discussion about communication and consent in sexual relationships, and ways to lower your risk when going out. Join Prism for a creative and interactive dialogue around survivors of sexual abuse/assault and how to navigate safe, empowering, sexually healthy lives. We will discuss the intersections of multiple identities and how they are independently and cohesively affected by sexual abuse/assault. Participants will gain tools and strategies to engage in meaningful conversations surrounding sexual assault, consent and how to help others through a sexual assault instance. Masculinity has long permeated queer spaces, but as of late, it has grown to be a toxic ideal. Together we will examine and deconstruct the systems of power that have made masculinity so toxic today. As we celebrate another year, students, alumni, faculty and staff gather to recognize award winners and outstanding contributions made to the LGBTQ community. 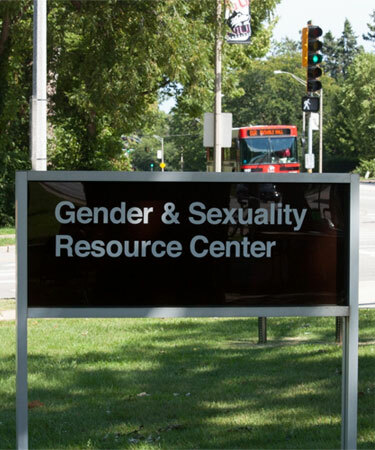 Reservations are required; call the Gender & Sexuality Resource Center for more information. Co-sponsored by Prism; the Center for the Study of Women, Gender & Sexuality; and PCSOGI. Are you interested in gaining more leadership experience on campus? Come to the GSRC for a workshop that will empower student leaders through a queer social justice lens! Although we will offer the workshop at two different times, please only attend one session. There will be various opportunities to gain student leadership experience at the GSRC after completion of the workshop. HerStory is a six-episode new-media series that looks inside the dating lives of trans and queer women as they navigate the intersections of desire and identity. After the showing, we will open the floor for discussion about salient themes and issues that are present in the series and in our society. Co-sponsored with the College of Liberal Arts & Sciences External Programming. Join the Center for the Study of Women, Gender & Sexuality for the last LGBT Studies brown bag talk of the 2015-2016 year. Check the website for information on the topic and speaker. Friday, May 6, 1 to 4 p.m. The Center for the Study of Women, Gender & Sexuality hosts the second annual CSWGS Student Symposium. Student papers will address a broad range of topics related to women, gender and sexuality studies. Friday, May 6, 4:30 to 6 p.m.
Come celebrate the accomplishments and recognize the contributions of Center for the Study of Women, Gender & Sexuality students, faculty and partners. Graduation cords will be handed out to all undergraduate WGST and LGBT Studies students who are graduating in May. Refreshments will be served. Honoring students with diverse sexual and gender identities, this ceremony celebrates the achievements and persistence of individuals graduating in December 2015, May 2016 and August 2016. Graduates will receive rainbow tassels. Participant reservations are required; call the Gender & Sexuality Resource Center for details.